Guys, herewith your request the tarot about TaeNy. Please don’t believe my tarot 100%, I really don’t know about their real life, I only read based on the tarot card. And sorry about my bad English, I try to find the closest meaning in English. Taeyeon now is more calm her self while she trying to control her emotion, mood, more like self-correction. Tiffany, well she’s have an ambition to get her goals. And now she’s on her way to get that. And no one can stop her. 1. Are they in love relationship ? But they know it isn’t right and they really worry about it. so they want to finish it, but since its hard for them, so they still running the relationship, while clock still ticking like a bomb. 2. So who is the one take the first move? Well, its more like Taeyeon have a strength feelings to Tiffany, but she know this is so wrong, and she feels so confuse between heart and mine. But Tiffany give her some courage because she have strength feelings too. 3. How long the relationship runs? Maybe its about 3-4 years. And I feel really bad because there are know their relationship and hate them. But TaeNy try to being strong. 4. Are they will go on their relationship until they’re growing older? Because like i said before they know it isn’t right. The only one reason why they are separate is because the rules of their religion. 5. (Pardon me for asking this question), did they getting laid (make love)? Yes. And guys, in this cards looks like they’re sooo happy. Well, I dunno what to say but, at least they love each others and separate not because one of them cheats. I wish all the best for them and may God always protect then through the hard time. did you post this before the confirmation of khunfany? 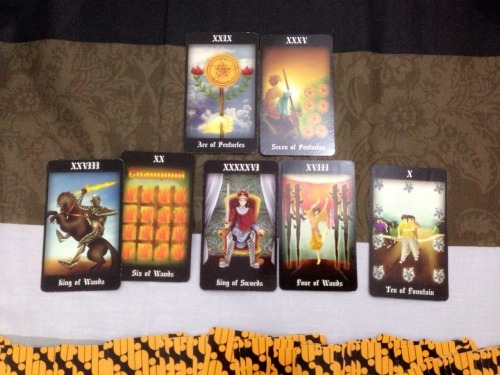 Interesting post and congratulations for taking the leap and doing an online reading. I enjoyed your interpretations, but you really should have a little more confidence in your reading. The tarot is a window into the world and situations of others and can be a wonderful tool to help and guide others during their times of trouble. Do you read on all areas of life, or do you specialize in love and relationships? I enjoyed your reading. How long have you been using the cards?